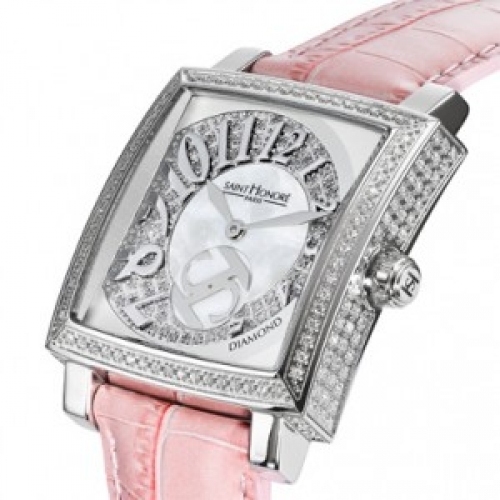 True to the spirit of the world famous Parisian couturiers, Saint Honoré is launching its new collection, Haute Couture, paying homage to one of the most exacting talents in the watchmaking industry: the setting of diamond. Entirely custom-made, each order is specific and can contain highly exclusive pieces, like the “full pave” with its 250 diamonds and 2 carats. Whether in the Haussman or Orsay models, the Saint Honore Haute Couture collection is an irresistible combination of beauty and power, elegance and strength, polish and prestige. Crazily chic, with its monogram rotating like a Tourbillon, the Orsay version takes its inspiration directly from the SAINT HONORE Tourbillon 1885 Collection launched in 2005.